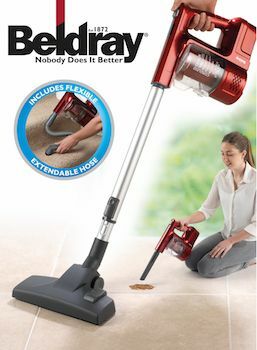 Users can keep their homes clean and tidy with the new Beldray Quick Vac Lite. Simple and straightforward to use, the Quick Vac Lite is designed to the highest standard specifically to ease the pressures of modern life. Complete with 22.2V rechargeable lithium-ion battery and a 500ml dust container you can get 20-25 minutes operating time. The Vac includes a flexible extendable hose and converts to a handheld unit for floor to ceiling cleaning.